Nearly everyone has heard of Roca Verdi now, the northern area of Spain that has a lush green feel to it. The impression many get is that it is a just another clip up destination in Spain. To go there for clipping bolts though is to totally miss the point of the area, as it is the adventure climbing that the area should bec.ome known for, sunny alpine rock climbing. An almost perfect place for british trad climbers who want a hot rock climbing adventure. The thing is Picos De Europa has never really been that popular, I suspect because it does lack some of the weather of Southern and Central Spain. 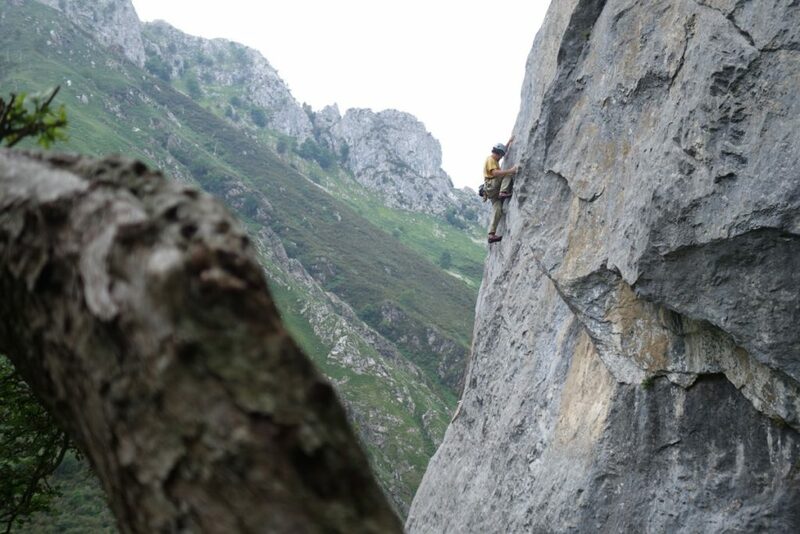 However, more and more climbers are visiting the area now and whilst many do stick to the valley floors there is no denying that the main event is the higher mountains and crags of the Picos. These are impressively steep limestone mountains that rear up from the northern coast of Spain a mere hour outside of Bilbao and even less from Santander. These peaks give the area one of an alpine feel and certainly add to the multiple flavours of climbing the area has to offer. Whilst spread out over a large area with difficult to reach valleys, the focal point for The Picos De Europa has to be Potes. An 8th Century market town built on the confluence of two major rivers in the area has a distinctly medieval feel to it with a complex maze of narrow stepped roads. With the main town being made nearly entirely of stone. As such it is something of a tourist destination in its own right meaning it has a reasonable infrastructure for basing you climbing holiday out of. To the North of Potes lies the twisting confines of the Hermida Gorge, a valley lined with a whole array of different single pitch sports climbing crags, like Rumenes, Urdon and El Salmon. Offering everything from slabs, walls to overhanging caves. With crags on either side of the North-South dividing line you can seek heat and shade in the morning and afternoon as you desire, and if it gets too hot just jump into the natural hot spring under the bridge to the spa in Hermida. If that was it for this valley it would keep you going for a week, but there is much more. The incredible Hermida Pillar rises 12 pitches from the valley floor to its rim, whilst at Cerro Agero there are more long routes of nearly all grades. It fact Agero is possibly the areas best-kept secret with some amazing 150 metre long routes on the El Resquilon that lead up to the main crag of Cerro Agero. Where the Epsilon Sur and Water are two of the best trad adventures the area has to offer. Whilst further to the left is 10 pitch VS of Astrucones and the Macizo Cueto Agero which is like a mini Tremadog with mixed trad/sports multi-pitched routes. Further inland is Sotres, a kind of wild west frontier village right up in the mountains where you access the Northern side of the Picos de Europa mountain range. From here a few hours walk in leads to a mountain hut or a bivy under a boulder below the jewel in the crown of the area, Naranga Del Bulnes, a tombstone like monolith of limestone that on its west face has routes up to 29 pitches long, like the ultra classic Rabada-Navaro at f6c and it’s harder direct version at 7a. Both are coveted routes. Whilst on is South and East side there are more slabby and gentler routes, in particular the South Face with is climbed by one of the best 8 pitch Hard Severe’s you will find anywhere in the world. There are of course smaller and not so small outlying areas, like Pena Cigar which has a few mulit-pitch sports routes. Although topping out is ill advised on some as the rock deteriorates. Similar there are a couple of crags up the Rio Deva toward Fuente Du cable car station with both easy and not so easy routes on them. Finally, the Fuente Du cable car gives rapid access to the Southern side of the Picos mountains and in particular the first collection of towers just 15 minutes flat walk from the top station. These give a host of E2 mixed trad and sports routes as well as another fantastic Aguja Ostaicoechea South Face a Hard Severe that spirals its way up the biggest tower in four pitches. Similarly for easy access to a cooler crag in the hotter months another 10 minutes walk is a fantastic little sports crag at the base of the Peña Olvidada. That has a spectacular setting. The best time for Rock Climbing is between the months of May and early October. As with any destination, there are exceptions, but summer is generally your best bet. The hotter, more stable summer weather systems can be expected through July and August and as with most alpine areas, there can be afternoon storms, but these are rarely as bad as the Alps. The snow usually arrives in late October and only melts away from the high Picos in May. What to do if the weather is bad? 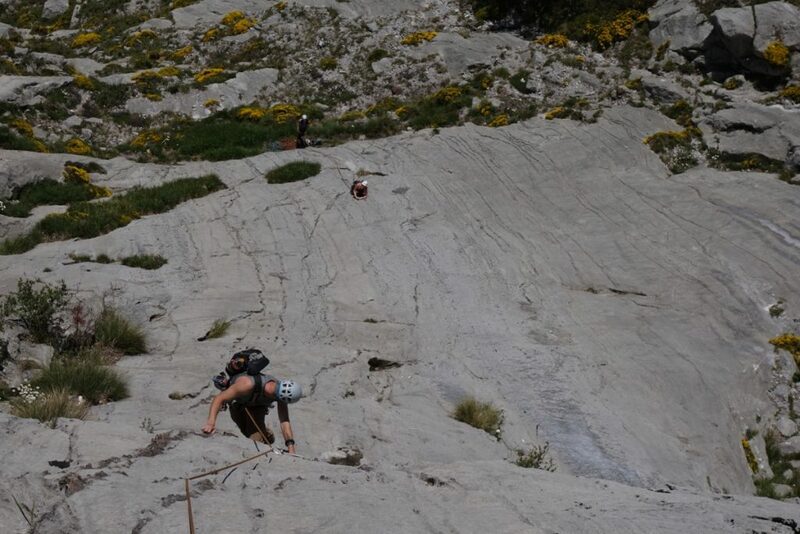 There are several things that are an option the first is the two amazing Via Ferrata’s the area has in Hermida and Los Llanos, a competent team could do both in a day. You can rent equipment at the Hermida Via Ferrata. Just 45 minutes drive north is the amazing beach of Playa Del Meron, which has some amazing surf if the conditions are right. Board hire is pretty reasonable and there are often many people there learning. Further along the coast is a place called Cueva Del Mar, often the weather gets sucked into the mountains and if you head to the coast you can escape it. This area has a nice cafe/bar, a beach and on its far side some single pitch sports climbing. The final alternative is to hire mountain bikes and arrange to get the first cable car up in the morning and do a rather exhilarating descent from the top of Fuente Du back to Potes, which is nearly all downhill! There used to be a climbing shop in Odejo, called Guiatrek that was the best stock. However there was also a few small outdoor shops in Potes itself. Some of which had a limit amount of climbing equipment in. There is a Decathlon in Santander which is the nearest major city. How do I get there and getting about? You can drive from the UK down through France of course or get a ferry from Plymouth or Portsmouth to Santander or Bilbao respectively. After the cost of the channel ferry, petrol and tolls it is probably as cheap or camparable to take the long ferry to santander or Bilbao. This is a relatively expensive crossing, but allows you to arrive a bit more refreshed! The other option for shorter trips is to fly to Bilbao or Santander, with Bilbao now having cheap flight operators flying there regular from a few major UK airports. Car hire is best sourced at the airport via a variety of budget firms. It is often best to book in advance. Buses run to the major towns and you can get to Potes, but getting from there to the crags would be difficult. There are a variety of places in Potes, from apartments, hotels, B&B and Holiday lets. Remember that the area is much more Spanish than the south of Spain and not many of the locals speak English by choice. So Google translate will be your friend if you are not too fluent in Spanish. There are also a couple of campsites just outside Potes but again they require you to have a car to get to and from. Wild camping is permitted in most areas, but only between sundown and sunrise. The only problem with camping is that there are not many water sources in the mountains. 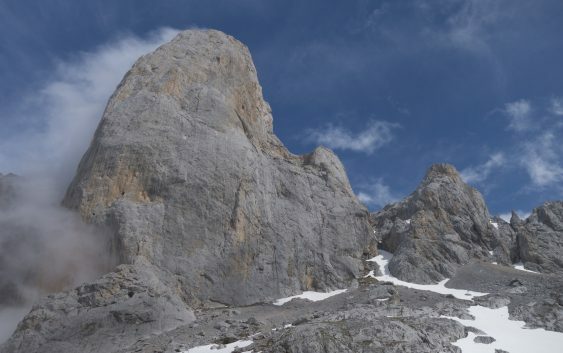 Our sister site Sunnier Climbs organises trips to Picos De Europa. Our head coach Mark has spent nearly 5 months in Picos De Europa and is part way through writing a new guidebook to the area. 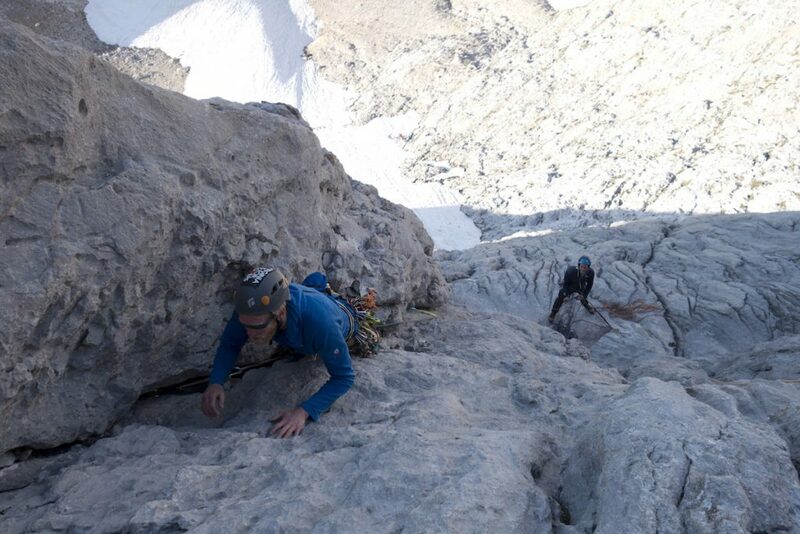 You can find out more about our hot rock coaching and adventure climbign holidays to Picos De Europa here.